My old pilot tells me we are being transferred from the 75th to the 100th Bomb Squadron.1 Supposedly, we will go back up into combat to man “H” planes.2 A new squadron being formed. Read magazines the rest of the day and saw the picture, Tales of Manhattan3. 1 The 100th Bombardment Squadron was located at the forward base on Stirling Island. For any aircrew members transferred from the 75th Bombardment Squadron to the 100th, this meant an immediate return to combat. The 100th Bombardment Squadron had been assigned to the forward base since at least May 1. 42nd Bomb Group Historical Report for June 1944. Headquarters 42nd Bombardment Group (M), 1 July 1944, microfilm B0131, Maxwell AFB, AL: Air Force Historical Research Agency, 1973, frame 1658. 2 “H” planes. The North American B-25H Mitchell was powered by two Wright R-2600-13 turbo-supercharged radial engines of 1,700 hp each (takeoff power). It maximum takeoff weight was 33,500 lbs. Empty, it weighed 19,600 lbs. It had a wing span of 67 ft 7 in, length of 51 ft, and height of 15 ft 9 in. Its maximum speed was 275 mph at an altitude of 13,000 ft. It had a range of 1,350 miles. It had a crew of five. Its armament consisted of one 75 mm T13E1 cannon, fourteen .50 cal machine guns plus 3,200 lbs of bombs. Eight of the fourteen .50 cal machine guns were forward-firing strafing weapons. 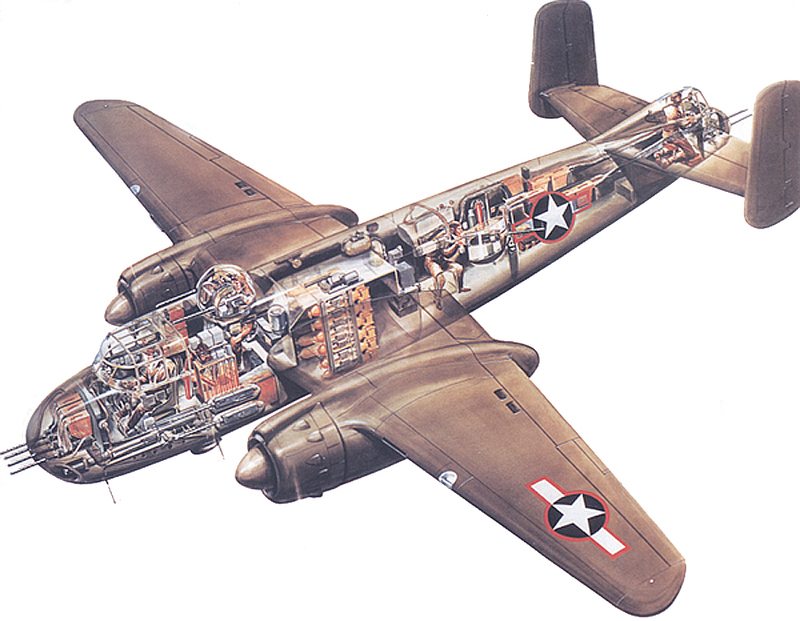 Notice in the cutaway drawing above of the North American B-25H Mitchell that the tail gunner kneels in his position. The tail gunner sat on a bicycle-type seat which partially relieved the weight on his knees. Wayne commented that on long missions where enemy intercepts might be expected riding in this position would become very painful. 3 Tales of Manhattan starred Rita Hayworth, Charles Boyer, Ginger Rogers, Henry Fonda, Thomas Mitchell, George Sanders, Elsa Lanchester, Charles Laughton, Edward G. Robinson, Paul Robeson, Ethel Waters, Eddie “Rochester” Anderson, and Cesar Romero among others. Tales of Manhattan was produced by Twentieth Century Fox Film Corporation and released in August 1942. Brief stories tied together by an unlucky tail coat, interesting as a chance to see some great stars in their prime. The first story is a romantic triangle with Charles Boyer, Rita Hayworth, and Thomas Mitchell. The coat moves to another owner, a fanciful tale featuring Henry Fonda, Ginger Rogers, and Cesar Romero. The coat is next bought by Elsa Lanchester for her (real-life) husband, Charles Laughton, playing a down-on-his-luck musician and composer. It then comes into the possession of a disbarred lawyer, Edward G. Robinson who meets a classmate, George Sanders, at a very elegant college reunion. The coat is taken by two gangsters who lose it, and found by the very poorest of the poor, the Black community of the depression-racked 1930’s, played by famed singer Paul Robeson and the great Ethel Waters, who go to their pastor, Eddie “Rochester” Anderson, with whom the coat finally brings something good. Tales of Manhattan. (http://www.imdb.com/title/tt0035415/?ref_=tttr_tr_tt : accessed 18 June 2014). This entry was posted in Uncategorized and tagged 100th Bombardment Squadron. Bookmark the permalink. You are the expert, Kevin, on the 100th Bombardment Squadron. Your site, http://k9iua.atwebpages.com/b25h_pictures.html, provides by far the most comprehensive and easily accessible information available on the B-25H. The photograph of the tail gunner’s position was of particular interest to me because it clearly showed the “bicycle seat” that Wayne used to speak of. The photograph also showed the cushions (although not marked as such) on which the tail gunner knelt while attempting to rest the weight of his body on the seat. I take Wayne’s Journal day-by-day. Wayne knew he was going to be assigned to the 100th and that they would be flying “H” planes. The 100th had been on Stirling Island while his unit was there in May and June. When he wrote “A new squadron being formed” on June 19, could he have been referring to the aircraft of the 100th Bombardment Squadron being changed over to the “H” models?.